Egypt said it carried out fresh airstrikes on the Islamist stronghold of Derna this morning in conjunction with the Libyan National Army (LNA). It claimed there were no civilian casualties in the attacks, which reportedly included the town’s power station and electricity distribution network. The Egyptians said that they were striking at strategically important points held by the Derna Mujahedeen Shura Council (DMSC). Egypt and the LNA have been targeting locations in Jufra as well as Derna over the last few days with 15 airstrikes unleashed on Friday. Cairo says its new air campaign is in retaliation for the so-called Islamic State (IS) attack that killed 30 in the Egyptian province of Minya on Friday. 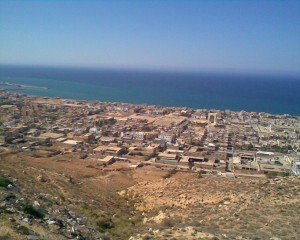 This, even though IS was ousted by the DMSC from Derna nearly two years ago. At a press conference with his Russian counterpart Sergei Lavrov in Cairo today, Egyptian foreign minister Sameh Shoukry said militant training camps in Libya were a huge threat to Egypt. “Egypt targeted the bases of these organisations in order to get rid of them and to limit their ability to threaten Egypt’s national security. This is in full coordination with the Libyan National Army,” Shoukry said. This cooperation was confirmed by the LNA’s spokesman Colonel Ahmed Mismari. The LNA’s air force said yesterday that Saturday’s strikes targeted Jufra airbase and an ammunition store in Hun. However, local officials in Hun said the strikes had also cut electricity to a number of neighbourhoods. The General Authority of Awqaf and Islamic Affairs was also reportedly hit. Jufra airbase is controlled by the Misratan 13th Brigade, previously known as the Third Force, with support from the Benghazi Defence Brigades. When the LNA took Tamenhint airbase, 60km from Sebha, from Misratan and Islamist fighters last week Mismari said remnants of the militias were heading north to Jufra.